is Dixie Professor of Ecclesiastical History in the University of Cambridge. 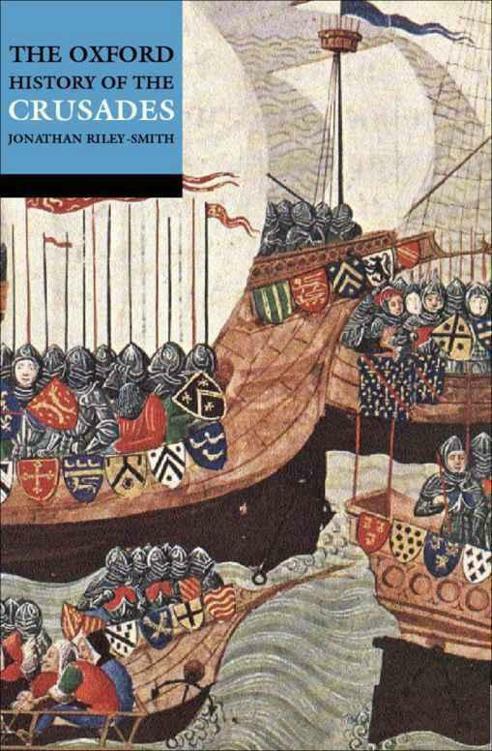 This volume reflects the recent developments in crusade historiography which are described in Chapter 1. It covers crusading in many different theatres of war. The concepts of apologists, propagandists, song-writers, and poets, and the perceptions and motives of the crusaders themselves are described, as are the emotional and intellectual reactions of the Muslims to Christian holy war. The institutional developments—legal, financial, and structural—which were necessary to the movement’s survival are analysed. Several chapters are devoted to the western settlements established in the eastern Mediterranean region in the wake of the crusades, to the remarkable art and architecture associated with them, and to the military orders. The subject of the later crusades, including the history of the military orders from the sixteenth to the eighteenth centuries, is given the attention it deserves. And the first steps are taken on to a field that is as yet hardly explored, the survival of the ideas and images of crusading into the nineteenth and twentieth centuries. In November 1095 a church council was meeting in Clermont under the chairmanship of Pope Urban II. On the 27th, with the council coming to an end, the churchmen, together with some lay people mostly from the countryside around, assembled in a field outside the town and the pope preached them a sermon in which he called on Frankish knights to vow to march to the East with the twin aims of freeing Christians from the yoke of Islamic rule and liberating the tomb of Christ, the Holy Sepulchre in Jerusalem, from Muslim control. As soon as he had finished Adhémar of Monteil, the bishop of Le Puy who was to be appointed Urban’s representative on the expedition, came forward and was the first to take the cross, while the crowd called out ‘God wills it!’ Although the eyewitness accounts of this assembly and the pope’s sermon were written later and were coloured by the triumph that was to follow, they give the impression of a piece of deliberate theatre—a daring one, given the risk involved in organizing an out-of-doors event at the start of winter—in which the actions of the leading players and the acclamation of the crowd had been worked out in advance. southern and central France. The summoning of an expedition to the aid of the Byzantine empire had probably been in his mind for several years and it had been aired at a council held at Piacenza in March which had heard an appeal from the Byzantine (Greek) emperor Alexius for aid against the Turks, who for over two decades had been sweeping through Asia Minor and had almost reached the Bosphorus. Soon after Urban had entered French territory he must have discussed his plans with Adhémar of Le Puy and with Raymond of St Gilles, the count of Toulouse, whom he wanted as military leader. These meetings cannot have been confidential and there may have been some truth in a tradition in Burgundy that ‘the first vows to go on the way to Jerusalem’ were made at a council of thirty-six bishops which had met at Autun earlier in 1095. Another tradition was that the wandering evangelist Peter the Hermit was already proposing something similar to the crusade before it was preached at Clermont. Peter was congenitally boastful and the stories of his pilgrimage to Jerusalem, the appeal to him by the patriarch, his vision of Christ, and his interview with the pope in Italy at which he persuaded Urban to summon men to Jerusalem’s aid seem to have originated in Lorraine, not far from the abbey of Neumoustier where he lived once the crusade was over. But at the very least there must have been a lot of talk and some preliminary planning in advance of the pope’s arrival at Clermont. Urban seems to have followed up his proclamation by preaching the cross wherever he went in France. By the following spring crusaders were assembling for what came to be known as the First Crusade (1096–1102), the climax of which was the capture of Jerusalem on 15 July 1099, an achievement made all the greater for contemporaries by the catastrophic defeat by the Turks in Asia Minor two years later of the armies of a third wave of crusaders. Jerusalem could not be held in isolation and its capture inevitably led to the establishment of western settlements in the Levant (which are known collectively as the Latin East). These soon came under pressure and military expeditions had to be organized, and military orders were founded, to assist them. Crusades were in action in 1107–8—although this was diverted into a preliminary and disastrous invasion of the Byzantine empire—1120–5, 1128–9, 1139–40, and 1147–9; the last of these came to be known as the Second Crusade. Meanwhile, the movement had been extended to Spain, the reconquest of which from the Moors had already been equated with the liberation of Jerusalem by Pope Urban II. Crusades in the peninsula were preached in 1114, 1118, and 1122, when Pope Calixtus II proposed a war on two fronts with armed forces serving concurrently in Spain and in the East. Calixtus’s initiative was developed by Pope Eugenius III in 1147 when he authorized a crusade against the Wends across the northeastern German frontier at the same time as crusaders were being called to serve in Spain and Asia. The Second Crusade was a fiasco, and although there were three further crusades in Spain before 1187, one in northern Europe, and a few expeditions, notably that of 1177, to Palestine, the thirty years that followed were in many ways the lowest point the movement reached before the fifteenth century. Everything changed, however, with the consternation that swept Europe at the news of the Muslim victory at Hattin, and the loss of Jerusalem and nearly all of Palestine to Saladin in 1187. The Third Crusade (1189–92) and the German Crusade (1197–8) recovered most of the coast, ensuring the survival of the Latin settlements for the time being, and enthusiasm was to be found at every level of society throughout the thirteenth century. Feelings among the masses were expressed in the Children’s Crusade (1212) and the Crusade of the Shepherds (1251), while military forces sailed to the East in 1202–4 (the Fourth Crusade, diverted to Constantinople, which the crusaders took, together with much of Greece), 1217–29 (the Fifth Crusade, which ended with the recovery of Jerusalem by treaty by the excommunicated Emperor Frederick II), 1239–41, 1248–54 (the first crusade of King Louis IX of France, inspired by the loss of Jerusalem in 1244), 1269–72 (Louis’s second crusade) and 1287–90; crusading armies invaded Egypt in 1218 and 1249, and Tunisia in 1270.
and 1260, when the crusade was briefly extended to Africa; the highpoints were the victory of Las Navas de Tolosa (1212) and the conquests of Valencia (1232–53), Córdoba (1236) and Seville (1248). Crusading in Spain resumed in the early fourteenth century and again in 1482–92, after which, with Granada and the entire Iberian peninsula in Christian hands, it spilled into North Africa and led to the establishment of beachheads as far east as Tripoli. In the Baltic region crusades were launched in support of Christian missions in Livonia between 1193 and 1230, after which the Teutonic Knights took over, and in Prussia, where the Teutonic Knights ran a ‘perpetual crusade’ from 1245 until early in the fifteenth century. Crusades were also waged in Estonia, Finland, and Poland. From 1199 onwards crusades were fought against political opponents of the papacy in Italy—they were endemic between 1255 and 1378—Germany, and Aragon, while the Papal Schism generated crusades in Flanders and Spain in the 1380s. The first crusade against heretics, the Albigensian Crusade, was in action in south-western France between 1209 and 1229; others were waged in Bosnia, Germany, Italy, and Bohemia, especially against the Hussites between 1420 and 1431. Crusades were also launched in 1231 and 1239 against the Greeks, who were trying to recover Constantinople; against the Mongols from 1241 onwards; against the Orthodox Russians in northern Europe from the thirteenth century and against the Protestant English in the sixteenth (the Armada of 1588). were those which took Smyrna in 1344, won the Battle of Lepanto in 1571, and recovered much of the Balkans from the Ottomans between 1684 and 1697, although there were also conventional crusades to North Africa in 1535, 1541, and 1578. Crusading, however, was petering out from the late sixteenth century, although the Hospital of St John still functioned as a military order in its order-state of Malta until that island fell to Napoleon in 1798. The crusading movement had involved every country in Europe, touching almost every area of life—the Church and religious thought, politics, the economy, and society—as well as generating its own literature. It had an enduring influence on the history of the western Islamic world and the Baltic region. Although until comparatively recently it tended to be thought of as something exotic and peripheral, it has never lacked historians. The foundations of modern scholarship were laid in the second half of the nineteenth century. This golden age, which ended with the outbreak of the First World War, was followed by a period of consolidation; indeed, the multi-volume histories of Steven Runciman and the American team of scholars led by Kenneth Setton (commonly known as the Wisconsin History), which had appeared or had begun to appear by the middle 1950s, could only have been planned in a relatively stable environment. , extracting from them references to laws which he thought could be dated to the twelfth century. His conclusions had been almost entirely ignored, but it was on the basis of the evidence he had brought to light that Richard and Prawer rewrote the history of Jerusalem, because it became apparent that the ossified feudal state of the thirteenth-century law-books did not accord with the reality of the twelfth century, nor, it transpired, with that of the thirteenth century either. The law-books increasingly looked less like authorities and more like intelligent but tendentious political tracts, written by partisans in a constitutional battle which had been raging in Palestine in the decades before they were composed. And the kingdom of Jerusalem began to look more ‘normal’, although of course with its own peculiarities, and subject to political and constitutional developments not unlike those elsewhere. The ‘constitutional’ approach to Jerusalem’s history introduced by Richard and Prawer held sway for about twenty years. In the mid-1970s, however, it began to give way to another way of looking at the politics of the Latin East, pioneered by Hans Mayer. In one sense this was a reaction not unlike that which took place among historians of medieval England in the 1930s, a move away from a bird’s-eye ‘constitutional’ approach to the grassroots and to the operation of lordship in practice; in this, of course, it drew close to institutional studies. It also seems to have been in tune with a mood which could be discerned in many branches of history, a disenchantment with the old conviction that the only successful states were centralized ones and a renewed interest in decentralized societies. A feature of recent work has been a concern with the way royal power operated in all sorts of small but subtle and effective ways in and through the fragmented feudal structures of the kingdom. Meanwhile, advances were being made in the study of crusade ideology. One reason for the growth of scholarly interest in this field was to be found in developments in other disciplines. Combat psychiatry had made great strides during the Second World War and knowledge of the effects of stress on individuals and groups had begun to percolate through society. Since it was becoming harder to categorize behaviour in war in the old clear-cut terms of heroism or brutality, crusaders were themselves becoming more interesting. And the theories underlying the notion of a just war were being considered more intensively. The Nuremberg Trials, proceeding on the assumption that crimes could be committed against humanity, had revived interest in Natural Law, and the debate whether obedience to orders was justified had raised questions relating to the traditional just-war criterion of legitimate authority. The doctrine of nuclear deterrence and the beginnings of a concern with proportionality was bringing another of the just-war criteria, right intention, into the foreground. The triumphs of the Crusade were the triumphs of faith. But faith without wisdom is a dangerous thing… In the long sequence of interaction and fusion between Orient and Occident out of which our civilization has grown, the Crusades were a tragic and destructive episode… There was so much courage and so little honour, so much devotion and so little understanding. High ideals were besmirched by cruelty and greed, enterprise and endurance by a blind and narrow self-righteousness; and the Holy War itself was nothing more than a long act of intolerance in the name of God, which is a sin against the Holy Ghost. they had been too simple-minded to understand what they were doing or to argue that they had been motivated, whatever they might have said, by desire for land or booty, although the latter explanation should have been hard to sustain. Everybody knew that medieval warfare had been costly and a mass of material was already in print, even if unread, which demonstrated the financial sacrifices men and their families had to make to take part in crusading. In other words, historians were blinded to facts and evidence by their abhorrence of ideological violence and their inability to comprehend that it really could have had a convincing appeal. They, and everyone else, had forgotten how intellectually respectable the Christian theory of positive violence was. No one seems to have been prepared for its revival in the 1960s in South American movements of Christian Liberation, some of which had militant wings justifying the use of force, in this case rebellion, as an act of charity in accordance with Christ’s intentions for mankind and as a moral imperative. Crusade historians suddenly discovered that there were sincere and devout contemporaries of theirs holding ideological positions very similar to those maintained by the medieval apologists they were studying. And with their eyes opened, the fundamental weakness of the arguments for a general materialistic motivation and the paucity of the evidence on which they rested became much clearer. The adventulrous younger sons began at last to ride off the scene. Few historians appear to believe in them any longer. to be concentrated where the evidence is: on the abstractions of the intellectuals, the canonists and theologians, on the hybrid notions and prejudices of the nobles and knights, and on the arguments of the popes and preachers who mediated between the two groups. It is in the nature of intellectual work that enhanced knowledge and understanding generate as many questions as they answer; and in crusade studies it did not take long for a major question, which had been dormant for some time, to re-emerge. What was a crusade? It must be admitted that crusading is not easy to define. The movement lasted a very long time and opinions and policies changed; for instance, the development of crusade leagues was an adaptation of crusading to suit the rise of the nation state. Crusading involved men and women from every region of western Europe and from all classes; attitudes can never have been homogeneous. And it appealed at the same time to intellectuals and to the general public, so that we are faced by a range of ideas from the most cerebral to the most primitive, from the peaks of moral theology to the troughs of anti-semitic blood-feuds. Ideas from different ends of the spectrum, moreover, interreacted. Because crusading was a voluntary activity, popes and preachers had to transmit the theology in a popular form, and it was not uncommon for popular conceptions to attach themselves to official Church preaching. For instance, crusades had technically to be defensive—Christians could not fight wars of conversion—but at grassroots’ level people perceived Christianity to be a muscular religion, and missionary elements again and again pervaded crusading thought and propaganda. far away, she saw the holy angels rejoicing and taking the souls of the dead (crusaders) to heavenly bliss without any purgatory’. She developed such ardour that she could scarcely restrain herself from making the journey to south-western France.
. Since then Elizabeth Siberry has shown that the twelfth-and thirteenth-century critics of alternative crusading were less representative than was supposed; and Norman Housley, who has become the leading apologist for pluralism, has provided a full-scale analysis of the political crusades in Italy, demonstrating how integrated they were into the movement. He has also written the first treatment of the whole range of crusading in the fourteenth century and the first comprehensive pluralist history of the later crusades. ‘perpetual crusade’, without the need for repeated and specific papal proclamations. In the Iberian peninsula crusading was much more under the control of the kings, especially the kings of Castile, than it was elsewhere. At the same time as they were debating definition, an increasing number of historians began to look westwards. Interest in the European theatres of war may have been partly responsible for this, but two other factors seem to have been more important. The first was the realization that huge caches of source material—even for the much-worked twelfth and thirteenth centuries—had not been used. The European archives of the military orders had been generally ignored in favour of the more glamorous eastern ones, in spite of the obvious fact that the fighting convents in the East of the Templars, Hospitallers, and Teutonic Knights, and the later order-states of Rhodes, Prussia, and Malta, relied on money, material, and manpower channelled to them from western Europe, where at any time most of the brothers were to be found. Any consideration of the religious life of the orders had to start with the fact that the norm was not military or hospitaller service in Palestine or Rhodes but estatemanagement and conventual life in the European commanderies, priories, and provincial masterships, and that it was there that many brothers found fulfilment. It was natural that there should emerge a group of historians, led by Alan Forey, Michael Gervers, and Anne-Marie Legras, who have concentrated on the orders’ western estates. Then there was all the material on crusaders in charters and governmental records, which was generally overlooked until Giles Constable drew attention to it. It is massive. For instance, at least a third of the individuals who are so far known to have taken the cross for the First Crusade are not mentioned in the narrative accounts of the expedition, but are to be found referred to only in charters. that probably would have found expression in wars of liberation whatever the situation in the East had been. Recruitment was certainly generated by the evangelization of churchmen, and the organization of crusade preaching, and the sermons preached—or at least the exemplars which have survived—are now being closely studied. But if many crusaders had been motivated by ideals, their ideals were certainly not the same as those of high churchmen, and what nobles and knights thought and what their aspirations were have become live issues. Some crusade historians, among them Marcus Bull, Simon Lloyd, James Powell, Jonathan Riley-Smith, and Christopher Tyerman, have been turning their minds to these questions, and a few directions for future research have been signposted. As we shall see, in the early stages of the movement the predisposition of families, and particularly of women in the kin groups, seems to have been an important factor; by the later thirteenth century local nexuses created by lordship, which had always been influential, were playing an even greater part. Popular religion, adapted to suit a society of extended families, was perhaps the major influence at first, but by 1300 it was being modified by chivalric ideas. North Africa at that time as a crusade, although they seem to have been using the term loosely. Setton demonstrated that that is exactly what it was. He wrote a sequel for the seventeenth century, and scholars now have a guide to material, particularly the archives in Italy, up to 1700. Associated with the history of Spanish crusading in the Mediterranean was that of the orderstate of the Knights Hospitallers of St John on Malta, established by the Emperor Charles V as an advance post blocking the sea route from Constantinople to North Africa. The catalogues of the archives of the brother-knights in Valletta have been printed, uncovering the sources for the history of a remarkable little state, the last survivor of the crusading movement, which did not fall until 1798. It is certain that there will soon be a body of solid academic work on centuries of crusading which have been virtually ignored. Whatever was going on beneath the surface forty years ago, the generally accepted history of the crusades related particularly to large-scale expeditions to the East and to the Latin settlements in Palestine and Syria. The interest of most historians evaporated after 1291, by which time crusading was believed to be in terminal decline. Since then the subject has expanded in time and space, as it has changed its nature to one extending over seven centuries and many different theatres of war. The prevailing interests used to be economic, proto-colonial, and military. Now they are religious, legal, and social, and there is a growing emphasis on the origins and endurance of the impulses to crusade. His thirst for blood was so unprecedented in recent times that those who are themselves thought cruel seem milder when slaughtering animals than he did when killing people. For he did not establish his victims’ guilt of a crime and then dispatch them cleanly with the sword, which is a routine occurrence. Rather he butchered them and inflicted ghastly tortures. When he forced his prisoners, whoever they were, to pay ransoms, he had them strung up by their testicles—sometimes he did this with his own hands—and often the weight was too much to bear, so that their bodies ruptured and the viscera spilled out. Others were suspended by their thumbs or private parts, and a stone was attached to their shoulders. He would pace underneath them and, when he could not extort from them what was not in fact theirs to give, he used to cudgel their bodies over and over again until they promised what he wanted or died from the punishment. No one knows the number of those who perished in his gaols from starvation, disease, and physical abuse as they languished in his chains. preposterous. From the point of view of the First Crusade, the description is of considerable interest because of the careers of the two men involved. Guibert was the author of a long chronicle of the crusade. The small number of surviving manuscripts suggests that it was less popular than some of the other histories produced by contemporaries, but it is nevertheless a valuable source for modern historians, not least because Guibert attempted to elaborate upon the facts—his information came to him second-hand—by explaining the crusaders’ experiences in learnedly theological terms. Thomas, for his part, was one of those who had taken part in the expedition. In the process he had earned himself a very favourable reputation, which Guibert attempted to twist around by claiming that he used to prey upon pilgrims journeying to Jerusalem.